It's done. At last. I ran and finished the marathon that has taken over my training for the last couple of months. I turned 40, embraced the mid life crisis and ran 26.2 miles on a road with not a trail or hill in sight. Not only that... I surprised myself and rather enjoyed it. The aim of my training was to finish the marathon in under 4 hours, but in the week before the race I was ill and wasn't sure whether I'd be able to run at all, so by race day, to feel well enough to take part was a bonus and my aim became simply to get around the course. All time pressure was off and my goal became one of completing and enjoying as much of the event as I could. 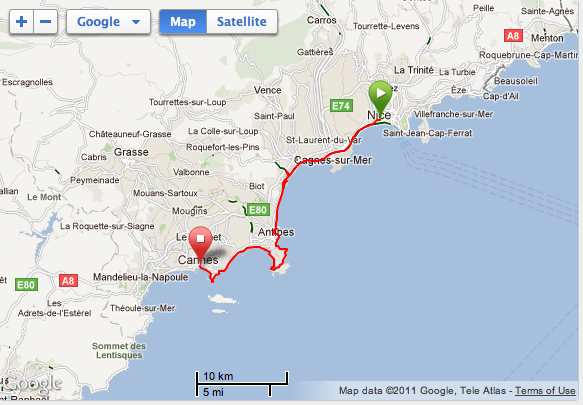 So we (me and Martin) did the Marathon des Alps - Maritime. Originally thought up as a great excuse for a weekend in the South of France to celebrate a significant birthday, enjoying fine food and wine, whilst fitting in a challenge along the way. I'm not going to try and write a race report here but just want to note a few memories to remind me of the day. I want to record that I geniunely enjoyed running this race, I really did. In almost every one of the official photos I'm smiling! There is a definite absence of the the usual pained grimace and this has to be because the pressure was off, I had good company and the promise of conversation throughout (no music this time) and the organisation of the race was excellent. The French know how to do things properly don't they? From the start, I felt like we were part of something big and exciting. 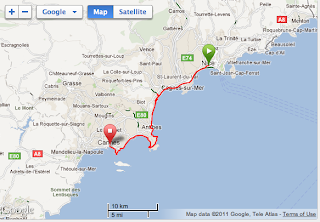 In the days before the race we explored the area around Juan Les Pins where we were staying. We saw them putting up the barriers, building small stages for the entertainment, erecting the KM signs along the route and there was a sense of community about the organisation of the event. It felt like a carnival was coming to town! On race day, all runners had free access to trains before and after the event, so at 6am we boarded a train that would take us from Juan Les Pins to the start line in Nice. The train was packed with runners. I've never been around quite so much technical gear before. It was one of those double decker trains and we were crammed in cheek by jowl. An entire community contained in quiet pre-race contemplation. I was impressed by the bag drop system - don't click away, it's not boring, it's clever! Because the route was linear the bag drop was a series of container lorries, kitted out with racks and hooks, each individually numbered to correspond with our race numbers. While we ran, our bags were transported to Cannes for us to collect at the other end - as I said, clever. Pre race nerves always demand that there are portaloos aplenty at any event, but there are never ever enough, and the glamorous setting didn't make the human excrement on the beach any easier to accept! Back at the start line, the race got underway without delay and the route wound it's way along the coastal road from Nice to Cannes taking in the seaside towns along the way, the old town of Antibes and the Cap of Antibes which were stunning set against the blue skies and twinkly mediterranean sea. The organisers laid on a smashing buffet on route - oranges, bananas, raisins, chocolate, sugar cubes (! ), gels, coke, sports drink, so there was no real need to carry your own stuff. By the half way mark, runners seemed to be milling about chatting at the stops as if at a cocktail party - very relaxed and social, but I'm sure that was just at my end of the event. I doubt the front runners had the same experience - poor them! The public support was relentless and really kept us going. Steel bands, break dancing children, traditionally dressed musical ensembles...there was something around every corner to perk you up and spur you on and because they print your name on your race number I lost count of the number of 'Allez Sarah!' 's that came from the crowd. It was a great day, and although I really didn't enjoy the endless boring miles of road running that I put in to train for this event, I am already looking for another marathon in May to celebrate our 12th wedding anniversary!